A Saint Bernard makes a great pet for anyone who has the space needed and can afford it's food. Some of the "working classification" of dogs include Saint Bernards, Alaskan Malamutes, Akitas, Bernese Mountain Dogs, Rough-Coated Collies, German Shepherds, Great Danes and others. On this lens I will focus on the St. Bernard. The most famous St. Bernard was a mountain-rescue dog named Barry. When Barry died in 1814 he had saved forty lives. This photo was taken by me, Marsha Camblin and is copyrighted. If you want to use it, get my permission, see contact me, and please link to this page. It is OK to pin it as long as there is a link. The dog gets it’s name from the “Hospice of the Great Saint Bernard Pass”, which was a mountain refuge founded by St. Bernard de Menthon in AD 980 on a mountain pass between Switzerland and Italy. The monks bread St. Bernards as guides and as rescue dogs to find people who were lost on the mountain. The first St. Bernards had short coats, but later were mixed with Newfoundlands which created a long-coated variety. When doing mountain rescue work the dogs went out in groups of four as a team. Once a victim was located, two of the dogs would lie next to the person to keep them warm, one would lick the person’s face to revive them, and one dog would return to the hospice or hostel to get human help. 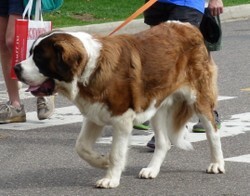 Often the St. Bernard had brandy in a barrel on the collar to be given to the victim to help in recovery. It's a fund-raising parade open to all dogs. Here is one of the participants. Anyone can enter their dog in the "race" which is actually a long walk around Washington Park with a bunch of other dogs and their owners. It takes place annually in May. You should come either to watch, which is a hoot, or to compete. They also have events and contests such as conformation. Usually they group the dogs by breed. Imagine showering your pooch in water that is energized, oxygenated, grounding, ionizing, and contains the imprint of flower essences and gemstone therapy. To order your cool shower head from VibesUP simply click on the image below. Pamper your pet this year! Hint: when you get to the page at the top of the page is a search box type in shower and hit enter. This breed loves to be of service to its human. Only Natural Pet offers thousands of high quality options from all the leading manufacturers of natural pet care products. That's who we use and recommend them highly. This article focuses on the large dog breed of Mastiff. Learn facts, see photos and gifts for both the dog and the owners. Helpful Hints for Guys or Gals Who Want To Be Thoughtful or Romantic for any special occasion. 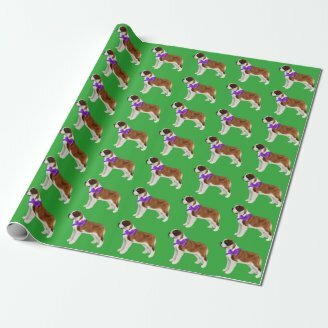 This hound dog is a very popular pet. Learn why families love this dog. Yes, it's convenient. Thanks for your visit. I love this historical information on Saint Bernard dogs. I had assumed they were named after Saint Bernard of Clairvaux, but I guess not. We also order our dog food online now and I love it. Yes, they are gentle giants. I have a cat that knocks things off the table with both tail and paws. I happen to love all large dog breeds. I used to babysit for a little boy whose family owned a St. Bernard and that dog would drink out of the fish tank, and knock everything off the tables with his tail! That was my only experience with a St. Bernard, but I thought he was beautiful.